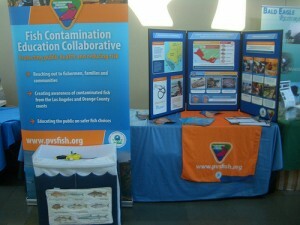 Would you like to join us in protecting the public against fish contamination? FCEC is now offering Booth in a Box; this is a perfect way for organizations to provide information on the Palos Verdes Shelf contamination and fish consumption guidelines with little effort and no cost. If you’re an angling club hosting a workshop, a community organization attending a health fair, or an environmental group planning an educational event, a Booth in a Box is an ideal opportunity for you. Once you download and print these materials, all that you will need to do is set up a table and distribute them. Whether you love fishing or are passionate about protecting the public against toxic chemicals, you can help to inform your community about fish contamination. Booth in a Box is easy to participate in, but goes a long way toward keeping your families, friends and neighbors safe.